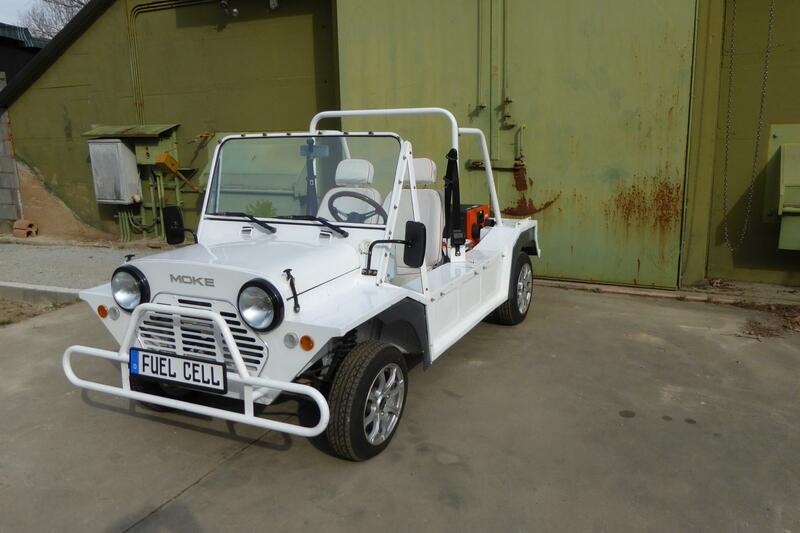 Originally based on a design of the British Motor Corporation and marketed under the name Mini Moke – “Mini” like the car and “Moke”, an old English word for donkey – the vehicle was developed as an economical and low-maintenance utility vehicle. The MOKE was used as a beach vehicle in Australia, the USA, France and tropical holiday resorts. Professor Dipl.-Ing. Wolf Burger, Head of Mechanical Engineering at the Duale Hochschule Baden-Wuerttemberg, wanted to find out how to electrify such a vehicle. Since he owns a MOKE himself and also has access to enthusiastic students, the prerequisites were given for starting the development project. The only thing missing was the fuel cell. Siqens was more than happy to supply it. As a Methanol fuel cell, the Ecoport 800 is an ideal range extender for different utility and commercial vehicles. Siqens will present this pilot project in words and pictures at the joint Baden-Württemberg stand and together with Professor Burger. Visit us from 1 – 5 April 2019 in Hall 2, Stand A18 at the Research & Technology, Hannover Messe. Professor Burger and staff from Siqens are open for your questions. Here, you can find out when the first road trips will take place. Today, SIQENS delivered a fully integrated EcoCabinet to a customer, the Autobahndirektion Nordbayern, the motorway maintenance agency in northern Bavaria. Once installed, the system delivers silent, low-maintenance and clean power to construction site facilities on the A3/A73 motorway junction near Erlangen/Fürth. The fuel cell supplies the video cameras on the Overfly, the overpass between the A73 and A3 motorways, with reliable power. Connect the power cable to the user application. For the motorway agency the purchase is not a one-off case. They already have experience with fuel cells and want to test further systems to determine the most suitable machine for a large-scale implementation. In the near future, applications at motorway building sites will be supplied with clean and reliable electricity from fuel cell systems. Together, Allgrand and Siqens will enter the Chinese market with the intention of replacing diesel generators and increasing the independence and range of commercial electric vehicles. 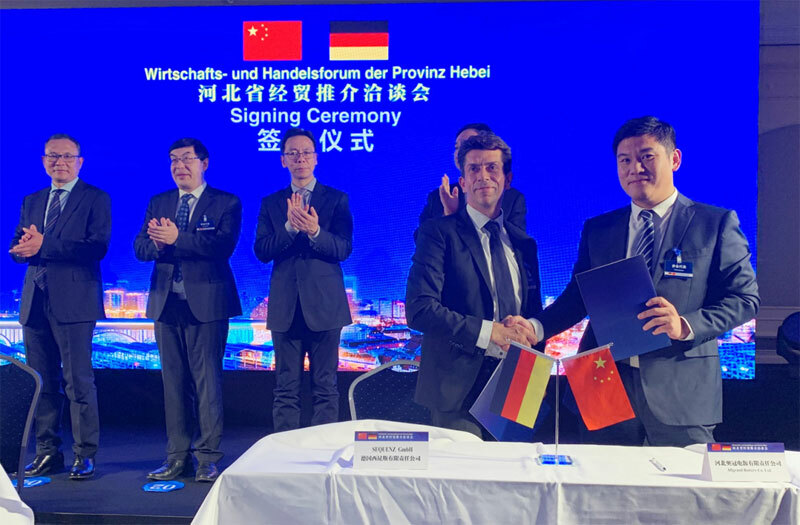 The MOU signing took place during the Hebei province economy and trade symposium in Berlin on November 23, 2018. The companies will enter a sales cooperation that targets telecommunication and commercial electric vehicles markets. This can lead to a joint venture that includes local production of Siqens methanol fuel cells. Allgrand is one of China’s top battery manufacturers focussing on solar energy storage, motive power, UPS and standby power and telecoms applications. The symposium participants included Siemens, Mercedes Truck & Bus China as well as leading German research institutes. Political support was present in the form of Zhu Haowen, Secretary General of the Hebei Provincial Government who delivered a supportive speech on the future of economic development in the province. Wang Weidong, a minister from the Chinese Embassy in Germany addressed the meeting and fostered closer cooperation. Oliver Meng, CEO of Allgrand – also known as Hebei Aoguan Power Source Co., Ltd. – highlighted the considerable market potential for fuel cell technology in China. China is ready and willing to combat air pollution with clean and cost effective power sources. Enter Siqens’ Ecoport fuel cell as a battery charger for off-grid applications and range extender in electric vehicles. 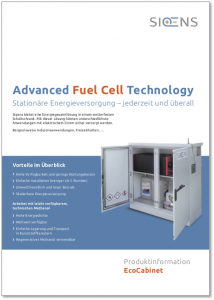 Fuel cell technology is a suitable addition to Allgrand’s product portfolio. For Siqens, the partnership is a further proof of the viability of entering the Chinese market to provide clean and affordable electricity. Allgrand has access to key market segments making a roll out of commercial projects likely next year. Making headway in the hard fought cleantech startup environment is a challenge. The competition for attention and investors is considerable. Outstanding companies with highly innovative products in areas such as energy efficiency, mobility, smart grid and advanced materials compete for best place in the 10th edition of the Global Cleantech 100 list. Using research data and expert panels the Cleantech Group chose the most innovative and promising ideas from more than 12,000 nominations worldwide. Siqens has made it to the Ones to Watch List, a select group of companies that are highly interesting to key investors and corporates in the market. This puts us within reach of the Global Cleantech 100 for next year’s edition. The expert panel evaluating the innovations gave strong support to Siqens’ Ecoport 800 fuel cell as a viable option for clean and efficient off-grid power supply for stationary and mobile applications such telecommunications and electric vehicles. We are making headway towards our vision of replacing diesel generators and supplying safe and clean power now and in the future. Why promote fuel cells in Asia? 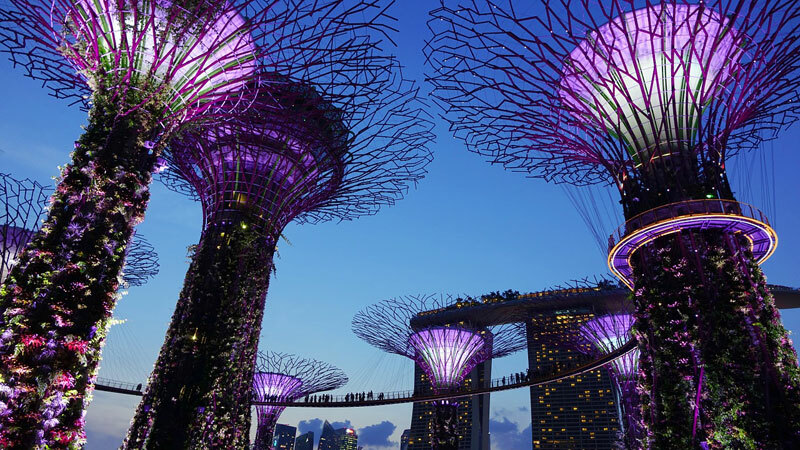 Siqens is heading off to the Cleantech Asia Summit from November 13 – 14, 2018 in Singapore. This is a meeting point for local, regional and global networks of entrepreneurial companies, investors and corporations working on the future of energy, power, mobility, waste and resource use. Is this really reason enough to travel that far? More people live in Asia than anywhere else in the world. Urbanisation continues to expand rapidly. Most of the world’s heavy industries are located here and the majority of the world’s products come from this region. Asia is growing. But according to the organisers of the Cleantech Summit, resource-efficiency is far behind its potential. Solutions are needed. Now these are good reasons to go. Asia is also a vast place – think of China or the many Indonesian islands – creating a serious challenge for infrastructure projects such as telecommunications. A classic case for off-grid energy supply. Enter Siqens with its excellent Methanol fuel cell providing clean, silent and low-maintenance power as a stand-alone power source, backup power or in combination with wind and solar. That is why Thomas Esser, Director Investor Relations and Partnering at Siqens, has been invited to speak at the Asia Cleantech Summit. He will be championing the high-temperature methanol fuel cell as the innovative energy solution for off-grid applications in the low kW range. The days of loud, smelly and costly diesel generators are coming to an end. Who does not want to be part of this trend? https://www.siqens.de/wp-content/uploads/2018/01/Siqens-Logo-500-300x113.jpg 0 0 Siqens GmbH https://www.siqens.de/wp-content/uploads/2018/01/Siqens-Logo-500-300x113.jpg Siqens GmbH2018-11-06 11:56:502018-11-06 13:45:35Why promote fuel cells in Asia? Siqens, with its innovative Ecoport 800 fuel cell and its market approach, was selected for the TOP 500 Deeptech Startups of the Hello Tomorrow Challenge. A total of 4500 worldwide applications were received in the renowned science and technology competition. Siqens convinced with its technology approach of a cost-effective energy solution based on methanol for the worldwide off-grid markets. Possible effects: The company must have the potential to exert a significant long-term influence on the economy and/or society. Leadership: The company must show visionary leadership with the ability to lead the company to success. Profitability: The company should have well-formulated plans for development and goals as well as a sustainable business model. Contenders for the Hello Tomorrow Challenge can win a variety of prizes. Above all, it is crucial for us to increase the visibility of our technology solution and to enter into direct discussions with exciting partners and customers. Both the Investor Day on 13 March 2019 and the Global Summit on 14 and 15 March 2019 are ideal locations for presenting, exchanging and developing sustainable partnerships. With strong partners we are getting one step closer to our vision of a diesel-free power supply in the off-grid markets. Hello Tomorrow is a not-for-profit organization that brings together a community of stakeholders who want to unlock the potential of technologies to solve the world’s most challenging challenges. They acquire deeptech projects and start-ups and facilitate collaboration between entrepreneurs, industries and investors to bring innovations from the lab to the marketplace. Hello Tomorrow organizes start-up competitions, mentoring programs, and a variety of events around the world, as well as training and consulting relevant stakeholders on the emergence of deep technologies. With the EcoCabinet (view datasheet), SIQENS offers a complete solution for off-grid power supply. In less than three hours installation time, 100% energy assurance is provided. Thanks to the EcoCabinet, uncomplicated, stationary power supply has become even easier. The system is designed for customers who, for example, operate an off-grid hut with PV system and battery and need an energy solution for bad weather and evening time. A diesel generator is out of the question. There is also no space to locate the fuel cell in the house. The weatherproof switch cabinet is installed nearby. 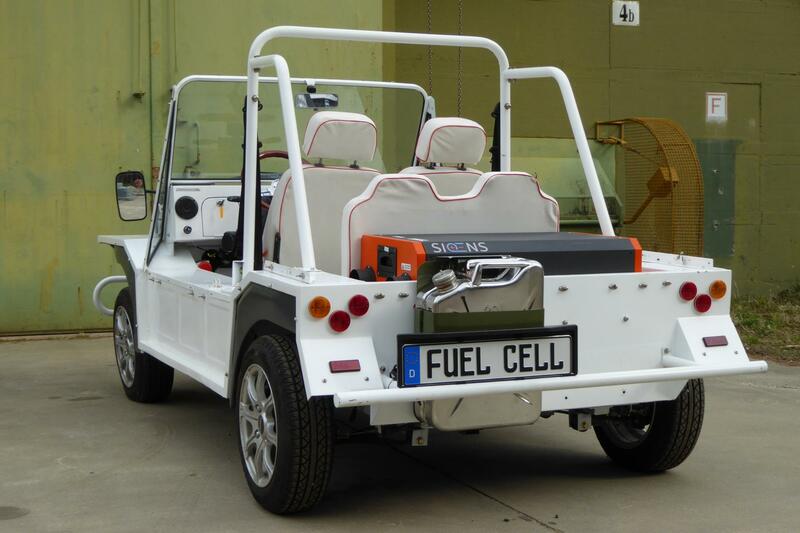 Fuel cell, methanol cartridges and accessories are stowed away and the power cable is connected to the in-house battery. From now on, the PV system and fuel cell will work together and provide 100% power at all times. Industrial customers are also well served with the EcoCabinet. For example, construction site surveillance can be up and running quickly and easily with SIQENS’ all-round energy solution. Stable as well as the clean, low-maintenance and noiseless operation make the Ecoport fuel cell an ideal energy provider for stationary off-grid power. 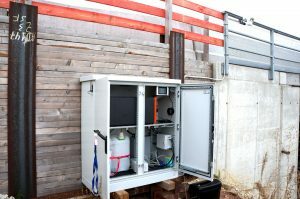 The EcoCabinet includes the Ecoport 800 fuel cell, control panel, modem, electrical distribution and fuses, 3 x 25 l QE charge methanol cartridges, outdoor switch cabinet, battery and additional accessories. Everything you need to deliver immediate reliable power. Would you like to feel free and independent on holiday? Yes, even freer, even more independent! For many, a good holiday means – besides relaxation and experiences – an increase in freedom. Being independent of the rhythms of everyday life and the routines of the working week. And in the foothills of the Bavarian Alps, this is especially easy. Mountain air, altitudes, alpine views and clear lakes embody simplicity and freedom. Nevertheless, you want a lovely living space. This needn’t be a contradiction. 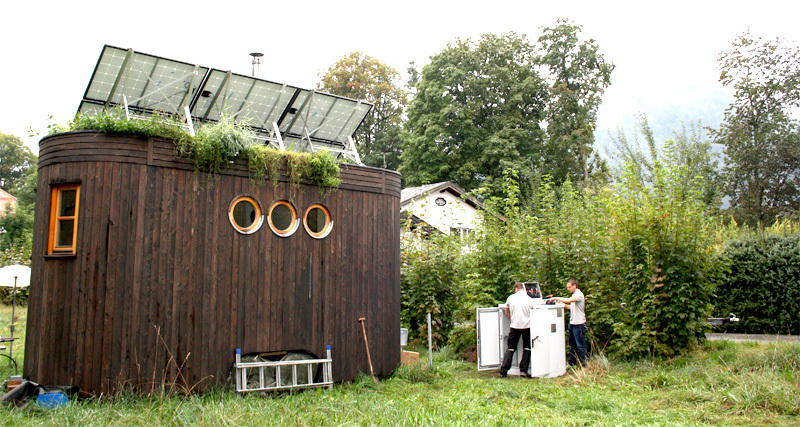 The Almwagen „Max“ am Tegernsee, a Tiny House concept developed by the Wohnwagon and run hosted by Daniel, provides an uncomplicated access to the Alps and is, at the same time, completely self-sufficient. The electricity comes from the sun, the water is cleaned with plants, the house is made of high-quality wood and all around are meadows and hedges. An ideal place for free recreation. And now more freedom has been added. 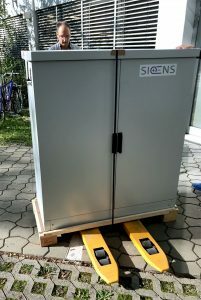 SIQENS installed its EcoCabinet, a complete ready-to-go ECOPORT system for stationary use, which will deliver backup power for the holiday guests – free of noise and exhaust fumes. Because at night or when the sun is not shining, self-sufficiency quickly comes to an end. With the innovative SIQENS fuel cell, and in combination with photovoltaics, one hundred percent independence is achieved without loss of comfort. A little bit about the technology and installation. The caravan and location for the EcoCabinet were ready when the SIQENS team arrived. The EcoCabinet contains the fuel cell, a lithium-ion battery, remote monitoring and space for up to three 25 l QE methanol cartridges. In addition, there are the connections, exhaust pipes, voltage converters, electrical distribution and battery status indicator. Everything you need to power a off-grid house. The installation went smoothly. All components were stored in the EcoCabinet, the power cable was connected to the caravans battery system and then buried in the ground. The Ecoport was started with the help of the ControlPanel and checked for reliable operation by remote monitoring on the laptop. Done. Ecoport and the photovoltaic system are now working together to supply the caravan and the guests with independent electricity. This is how it works: The Ecoport charges the in-house battery to 80%, the solar panels take care of the rest. Daniel and the guests have nothing to worry about. Switching between the two energy sources is fully automatic. That’s comfort, after all. And now? For SIQENS, Daniel and Theresa from wohnwagon.at this is a test run. Together, we want to discover the potential of combing fuel cell, solar and self-sufficient Tiny House living – for freedom, sustainability and a clear focus on the essentials in life. 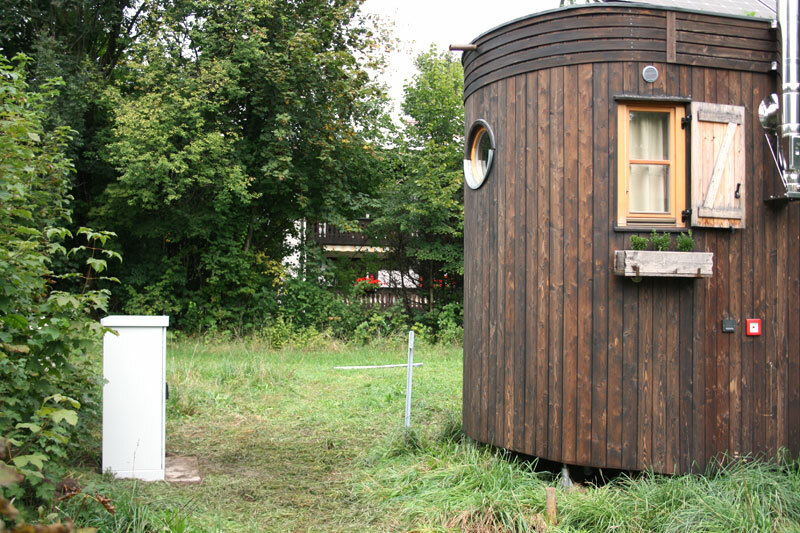 More about the Wohnwagon self-sufficiency approach. Experience the Almwagen „Max“ at the Tegernsee for yourself. Clean energy and security: really good partners! Video surveillance for construction sites in a residential area? Yes, but please no noise and without diesel exhaust fumes! The power supply for the outdoor festival is still missing, but the expensive event technology is there already? Where does the power for security monitoring come from now? Security and surveillance technology requires a reliable and continuous power supply. Especially in areas without connection to the power grid. Construction sites, sensors, plant monitoring systems – power must be available at all times, otherwise safety gaps will open up and lead to property damage, loss of time and additional costs. With the Ecoport 800, SIQENS offers the best solution for an off grid power supply – clean, silent and reliable energy at all times and everywhere. Whether as a stand-alone system or in combination with photovoltaics or wind. As an addition to photovoltaics and wind, our fuel cell provides 100 percent supply security, is silent, clean and safe and operates with commercially and worldwide available standard methanol. It runs at low operating costs even in extreme conditions from minus 25 to plus 50 degrees. https://www.siqens.de/wp-content/uploads/2018/01/Siqens-Logo-500-300x113.jpg 0 0 Siqens GmbH https://www.siqens.de/wp-content/uploads/2018/01/Siqens-Logo-500-300x113.jpg Siqens GmbH2018-08-28 14:11:322018-10-17 11:24:33Clean energy and security: really good partners! What do these two have in common? Far more than you might at first expect. Even during the preliminary planning stage for wind energy, these initial questions are essential a project to succeed: What is the right location? What are the earnings forecasts for financing and returns? Are there expected difficulties with the approval? What proof of safety for possible environmental damage must be provided? To name just a few. To find a suitable location for the production of wind energy, wind measurements must be carried out. They are essential for the economic efficiency of the facilities and therefore for the investment security. Nowadays, such measurements are mainly carried out with SoDAR (Sonic Detection and Ranging) or LiDAR (Light Detection and Ranging) measurement methods and usually take 6 – 18 months. Usually the areas to be measured are too far away from the power grid, which is why off-grid power supplies are used. Uninterrupted measurements are indispensable. 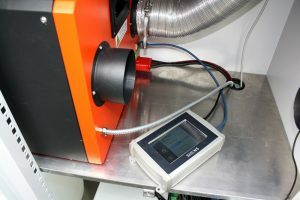 Therefore, continues energy supply is an essential component of a reliable series of measurements. Due to constantly changing weather conditions, photovoltaics and micro wind turbines cannot provide this high degree of supply security. Small diesel or gasoline generators, as they are often used up to now, have considerable disadvantages. Noise and exhaust emissions pollute the environment. And they have to be serviced regularly at short intervals, which is time-consuming and leads to high operating costs. This is where the methanol fuel cell comes into its own. Not only is it extremely quiet, there are no harmful emissions to pollute the environment. Methanol is neither hazardous to soil nor water. The use in nature reserves is therefore safely possible. The Siqens Ecoport 800 is maintenance-free over its entire lifetime, ensuring both low operating costs and self-sufficiency over several months. Remote monitoring virtually eliminates the need for on-site service. Once funding has been green lighted by the measurements, the approval procedure follows. The safety is evaluated by the authorities. Objections may arise that require additional expert opinions. Here, too, the clean, quite and reliable Ecoport 800 can be used, e.g. to document bird migration in the area in a similar manner as the wind assessments. Once all financial and official hurdles have been overcome, the construction can begin. Once the wind turbine has been completed, it only needs to be connected to the power grid to feed in the generated wind energy. However, this can take up to six months after completion. During this time the plant can neither produce electricity nor is energy available for its own supply. Even when not in operation, there is a need for electrical energy. Wind turbines are subject to laws concerning flight safety and must therefore be equipped with obstruction lights. The Ecoport 800 from Siqens demonstrates its advantages and supplies maintenance-free, environmentally-friendly electric power. The points of contact between wind power and fuel cells are greater than people initially think. They clearly show that niche applications are driving the shift towards clean energy supply. This is where the important supply gaps are closed. Only the interaction between different clean energy technologies will solve the climate and pollution problems as a whole.